Committed to personal transformation and to looking at life as an unfolding “Work of Art,” Dr. Zan E. Nix, facilitates the clarification of meaning, passion and vision. As a Life Coach, teacher and artist, I work with individuals and groups on expanding self awareness, increasing authentic expression, deepening intimacy with self and others and manifesting personal and collective visions. My PsychoSpiritualCreative Perspective is a reflection of my own work and education in psychology, education and practice in spirituality and being both a published poet and an award-winning singer-songwriter. Academically I hold both a Bachelors and Master’s degree in Psychology from Southern Oregon University (Ashland, Oregon) and a Doctoral degree in Spirituality from University of Creation Spirituality (Oakland, California). 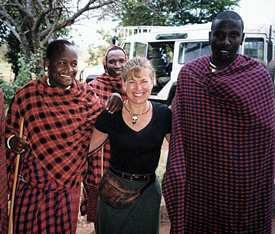 I’ve traveled extensively in India, Indonesia, Europe and Africa and lived in both Mexico and Greece. Home is in Ashland, Oregon with my running partner, Tenzing, a very handsome standard poodle! Zan Nix has been instrumental in supporting the work of our teams here at La Clinica through her ability to facilitate them in taking a pause to recognize each other’s strengths and focusing on attitude of gratitude. The hallmark of Zan’s life and work continues to be an abiding awareness of the sacred in every individual and in their potential to engage in the work of transformation.